Hard to say what will happen, but I wouldn't think they'd be so incapacitated for the remainder. Neither do I, but I was thinking they might be in danger until they reach Elfhelm. Then again, it may have absolutely no effect on them other than the feeling that the world has changed in some way, since they already sense something is up. Hahaha, goddamn it Griff, I thought that was real for a minute and my mind exploded Scanners style! I'd considered how it would affect Elfhelm too, but I don't think merging the worlds will necessarily be a "roadblock" for anything Guts and Co. are trying to achieve. Let's not forget that Elfhelm was already in the spiritual world though. It might actually not be affected too much compared to the rest of the world. Do you think the merging of the worlds will have any effect on Guts's and Casca's brands? I almost wonder if the pain would be so overwhelming that they'd be in mortal danger. They'll probably feel it. Being in mortal danger though... I don't think so. Seems like Skullknight just hightailed out of there. One wonders if SK had any indication that his attack won't work and if that is the case why would he continue with it? If the Beherit sword didn't work then does he have any other tricks left to face the God hand (other than Guts) ? Because Femto avoided the attack this time doesn't mean the sword cannot harm him or the others. And really, SK's been failing at taking them down for a long time, yet he's still trying. The man is obviously quite relentless. And patient. Very, very patient. Any speculations what might have happened to the beherit that changed Ganishka? Have there been instances where the beherit just disappeared after the apostle was killed/liberated? I wonder if Daiba will pick it up again. Who knows? Daiba might be carrying as we speak. Or maybe it went its way long ago. Beherits do their own thing. Maybe Femto was mocking him saying "Dokuro no Kishi"? How would that be mocking him at all? It's not like it's an insulting nickname. Yes? Congratulations for stating the obvious? You're the one assuming too much here. You don't know what SK thought or that he was certain his plan would work. He's been trying to destroy the God Hand for a long time, and so far he hasn't succeeded. Does that mean he will never succeed? We'll see by the time the series end. Furthermore, because Femto thwarted him this time doesn't mean his Beherit Sword cannot harm a member of the God Hand if it does strike him or her. How serious. Ok next time I won't joke with the obvious things. Ok. Got it. I am sorry for little irony. Ah, there was a joke? Haha, yeah, the original spread really sells the thought, I saw it and couldn't help but imagine seeing Idea coming out of there. Because Femto avoided the attack this time doesn't mean the sword cannot harm the God Hand. And really, SK's been failing at taking them down for a long time, yet he's still trying. The man is obviously quite relentless. And patient. Very, very patient. That's one way of putting it, but Guts would probably tell him to stop screwing around. It seems so, if it wasn't clear now you know it. This. Anyway I must apologize for having hit seriousness. I have put assumed italicized to express irony. If it wasn't clear, all I can tell you is a great sorry. Haha, definitely. Actually, their next talk (in Elfhelm, most likely) promises to be very interesting. How would Guts react if SK told him he tried to take the Falcon down and failed (assuming he tells him)? Somehow I have a hard time imagining Guts completely giving up the idea of killing him. Well it didn't seem so to me. And there's no problem with making jokes as long as they're comprehensible and actually funny. I have put assumed italicized to express irony. So what's ironic about it? I'm trying to understand your reasoning here. It would be ironic to say that SK planned his attack so well that he got played like a fool. Saying he assumed too much isn't ironic. Gutts is going to have to go through some super powerup if he even wants to get to Skull Knight's level of not succeding. Actually, their next talk (in Elfhelm, most likely) promises to be very interesting. How would Guts react if SK told him he tried to take the Falcon down and failed (assuming he tells him)? Somehow I have a hard time imagining Guts completely giving up the idea of killing him. Well, that ties into one of the important things I think Guts is going to get in Elfhelm, a higher purpose. I think his goals will come full circle, but his outlook and motivations will certainly change. Is the episode 305 preview real ???? Coming back to episode 304, thank you Ganishka, you perfectly played, until the end, the mission you was granted by Idea of evil (you too, SK)!! Rest in Peace Ganishka !! A lot of people were expecting Femto will find a way to escape SK attack, and he did it so easily !! Yeah, definitely. Forget the personal vengeance, he'll do it to SAVE THE WORLD! Griff, you gotta make your photoshops look crappier, you're confusing these poor souls. Ok I'll try one more time. Since SK is a VERY WISE BEING, (or am I wrong? ), he assumed too much. Anyway if a sentence doesn't make you smile doesn't mean that is not comprehensible for others. Than if you think that everyone has your exact conclusion, it's fine. Anyway if this explanation doesn't satisfies you I cannot help anymore. Since SK is a VERY WISE BEING, (or am I wrong? ), he assumed too much. Anyway if a sentence don't make you smile doesn't mean that is not comprehensible for other, than if you think that everyone has your exact conclusion, it's fine. Yeah sure dude, no doubt everyone else's having a blast here. Hi-la-rious stuff. wow, so much epicness its unreal! Not much clawing going on, though. I'm sure if it wasn't for Skull Knight's interference, Femto could have achieved the same... with his claws! Finally had the time to read 304! Just as all of you I am amazed and relieved to see after skully's attack from 303. 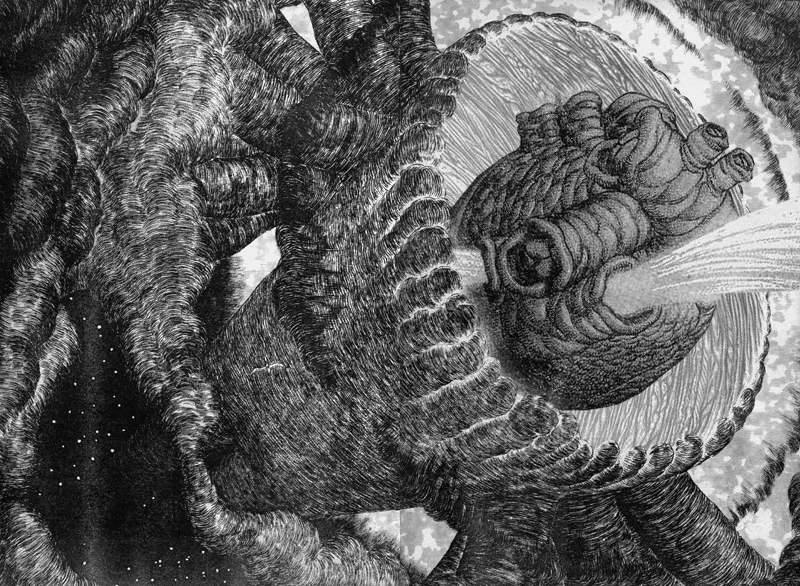 I was just just speculating in the last thread about how the last panel in 303 left me curious if indeed the slash hit Femto or not. I know now the results now, and I was still surprised. Now we have another bundle of pics to make more speculations. The 10-11 page reminded me of the space shuttle's thrusters as they are about to make lift off and then the big bang afterwards. Of course in a colossal scale. Thanks Miura for taking your time and delivering such wonderful art! Jesus Griffith you need to be more careful with your photoshop power! You almost gave me a heartattack! I don't know, but if this really is world encompassing, I don't know if I'd really want to be out in the middle of the ocean in case this all precludes to some sort of crazy monster infestation. But yes, all in all, I agree that this would be a very good time to go back to Guts and company. I'm crossing my fingers! Heh, you don't suppose Rakshas jumped onto SK when Zodd attacked him do you? I thought of that too because it would be easy to lose him in the similarly ragged draping around Skull Knight's horse, would be really cool, and mostly because we still don't know what the hell he was doing up there, other than observing. That said, Rakshas being able to pull that off without SK knowing seems as far-fetched to me as Skully hitting Femto completely unawares: unlikely to succeed. Still, it's right up Rakshas alley, and we don't know the full extent of his stealth abilities. In any case, it's amusing to imagine him hiding under Skully's horse all the way to Elfhelm.